It's no secret that controls for games on the iOS platform are often wonky and uncomfortable. We tend to forgive developers for this more than we'd ideally like to when it comes to our iPhones and iPads, if only to appreciate the game in question for its other qualities. The first League of Evil proved that even somewhat more complicated gameplay can still be a contender when on a bite-sized screen. The very basic two-arrow, two button interface makes for a simple control scheme, but this is far from the best thing about League of Evil 2. What's more compelling is that it proves 2D platformers as simultaneously addictive and frustrating as Super Meat Boy are actually possible on an iOS device. 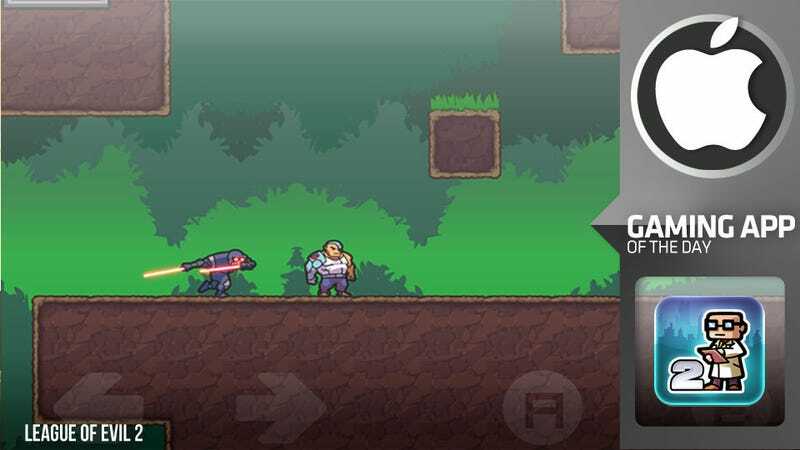 Playing as a wife-beater outfitted brute of a man with impossible strength thanks to his mechanical arm, you'll be serving justice to nefarious scientists who are cooking up all sorts of danger in the maze-like structures of each level. The journey starts off with relatively few obstructions: You'll encounter the occasional trigger-happy military unit who will shoot you on sight, as well as electrical currents running wild on some surfaces. The slow start lets you familiarize yourself with the controls, but your optimism might quickly run dry once you're hopping over floating hazards and avoiding turrets and other hostile robots. iOS games can have short life-spans; it's partially why having such a flooded app store suits the devices so well. League of Evil 2 never gives you a chance to tire of it when each new level is a chance to prove how good of a handle you truly have on the game. Sure, you may have picked up that sneaky bonus briefcase mid-air while jumping between electrical traps, but can you get the one hidden off in the corner and guarded by some beastly fiend? The art direction takes a turn from the original retro style of the first LoE to more beefed-out visuals here, which may or may not please you depending on your taste. Personally, I love the extra detail, and the environments certainly benefit from it. The music maintains the high intensity of its predecessor, and has the feel of something like Canabalt. It urges you to push forward at a fast pace that is both exhilarating and useful; platformers often require you to take advantage of small windows of opportunity at the risk of facing death, and this iPlatformer is no exception. Everything about League of Evil 2 encourages you to keep playing, to confront every challenge and bonus challenge, and to enjoy doing so all the while. Who cares if you die a lot?